In KLAVS 2013, the Interglobal booth on 4th floor was one of the places I spent a lot of money at as they carried a very nice selection of audiophile reissues of chinese music. I also bought the latest Micheal Buble LP from them as well. 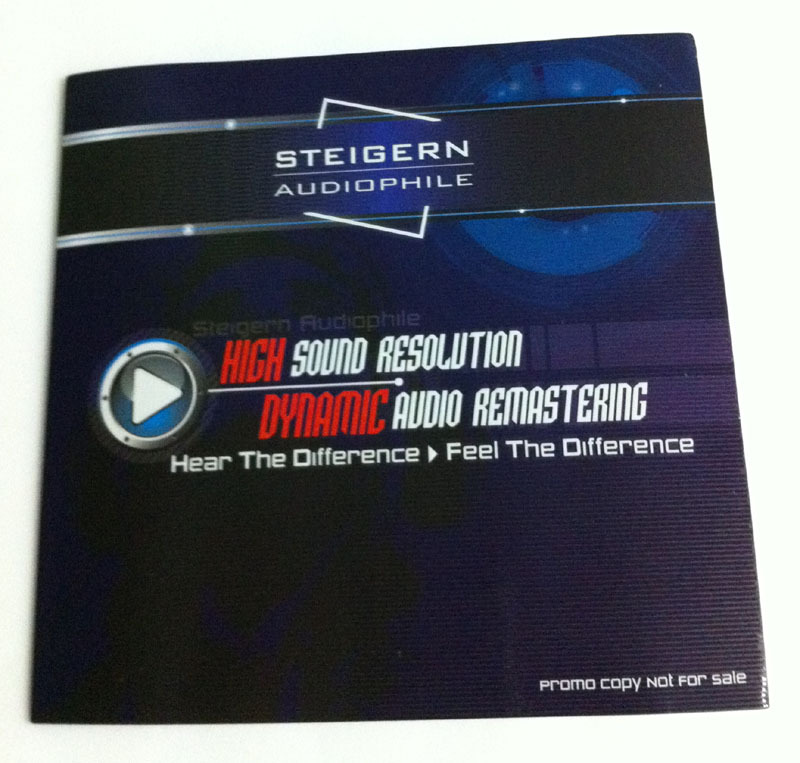 When I paid for my LPs, they gave me one of their special promo CDs, a demo CD which it seems to me is a future joint venture with local company 'Steigern Audiophile' based in KL for the remastering of popular titles in the Interglobal (i.e. 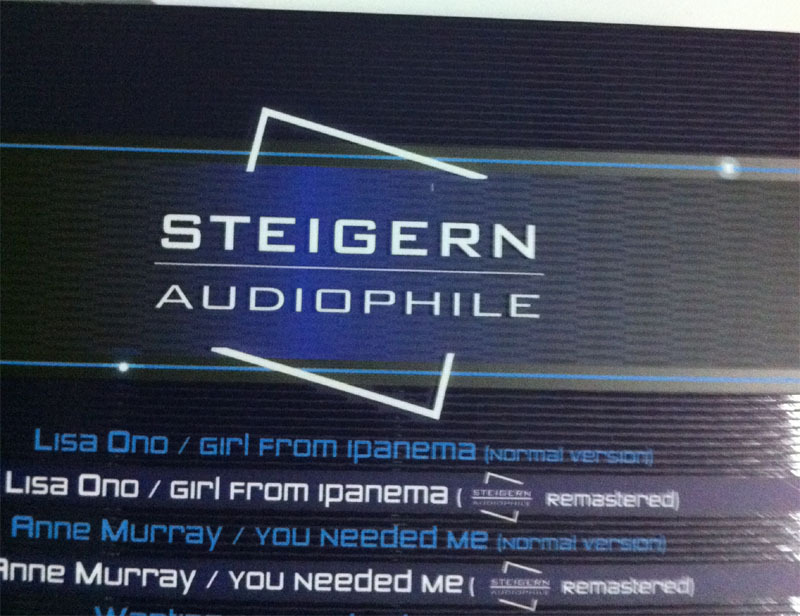 Universal and Sony Music) catalogs and subsequent release as 'audiophile editions'. The promo/demo CD thus contains a selection from their current project/future release and is formatted such that the before/normal version is in the first track, then followed by the remastered 'audiophile' version in the subsequent track. So of notable e.g. the 3rd and 4th tracks are of Anne Murray's 'You Needed Me' (original Anne Murray version, not a cover version by an amatuer artist). I had a brief listen on my digital-based system over the weekend and the difference was quite apparent, with the remastered version clearly a lot more clearer. However, I am not sure which mastering the before/original version is from. Photos of the promo/demo CD are below. It seems to me that this is going to be of good interest to local audio+music lovers as Interglobal's involvement would suggest accessibility to the huge catalog from Universal and Sony music. Will we see Michael Jackson's Beat It released on audiophile CD for e.g. ? I too was given a copy of this promo disc, courtesy of Interglobal tai kor. Very kind of him to hand one to me. Thank you sir! I appreciate this so much. Didn't get to catch him later as he's busy running the business there!..so I'll convey my heartfelt appreciation here. Ah yes, one more thing. For those who didn't get one but is curious, I have an extra copy which I am passing to Maxx trading in the near future. So you will be able to hear it in their shop if you are curious about it. Its merely serve to compare each original released track with the same they've remastered or enhanced to another level. Something like an original album and some K2 or XRCD enhancement. Everything is "improved", fuller, bolder, more upfront, fatter, ballsy and lastly a little LOUDER in short, but thankfully not as loud as some XRCD I own..which I think was like an overdone piece of meat. Enhancement have limits..go overboard and its not always a good thing. I think this label have done reasonably well without going overboard. I think I would buy the enhanced version of some albums they may offer in future. OTH, I'm more of a TT source man now..so an enhanced CD would be alternate choice if I can't acquire the LP of some album. Overall its a good job! For those who missed it. Can pay a visit to the "BookFest A Malaysia 2013" organized by popular, Lifestyle Pavillion Hall 3 at Level 3 (a separate exhibition hall from the books).